Fair-isle mittens, afterthought thumb. 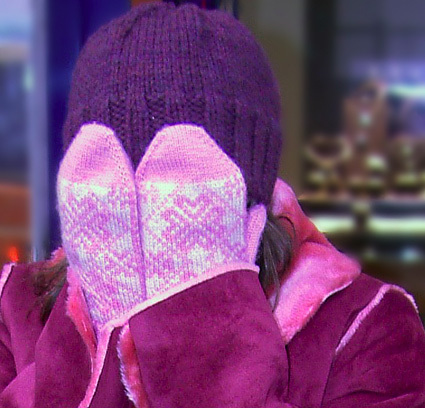 Sounds simple but there are many ways to jazz up these mittens. They can be knit from the cuff-to-top, in the normal way, or from the top-to-cuff for a bit of fun (guidelines for a top-down mitten are given as a variation at the end of the pattern). One great advantage to the latter method is that you can make the cuffs almost as long as you want without worrying that you'll run out of yarn later. If you'd like to make this design for a child, follow the directions as for the adult version but use 4ply yarn (such as Rowan 4ply soft or Jaeger Baby Merino 4ply) at a gauge of 32 sts/36 rows = 4 inches on smaller needles. This will give mittens with a circumference of 6[6.5, 7] inches. These mittens are quick to knit so they would a make a great last minute gift for someone, or keep them for yourself. 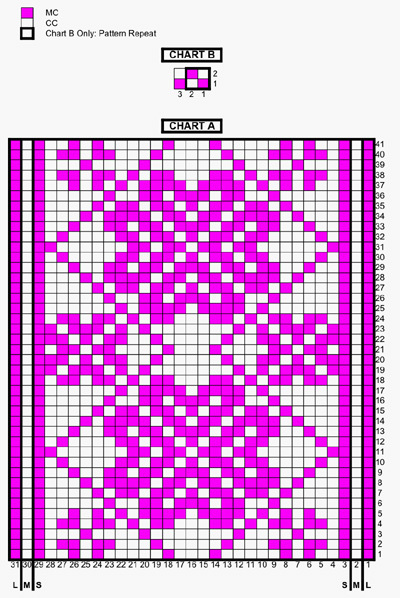 Charts were inspired by "Traditional Fair Isle Knitting" by Shelia McGregor. 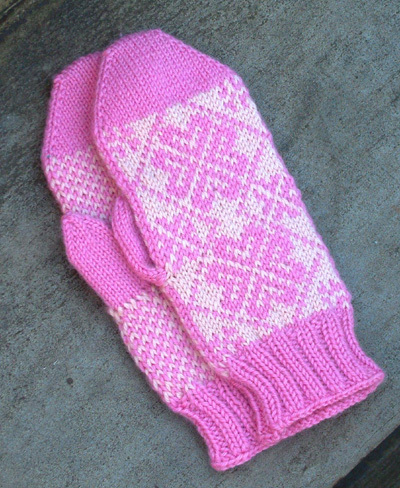 This mitten pattern utilizes an afterthought thumb, a la Elizabeth Zimmermann. An afterthought thumb is worked in much the same way as an afterthought heel. To make this thumb, the thumb sts are first worked using waste yarn, then they are transferred back to the left needle and worked again, using MC and CC in the pattern as set. After finishing the mitten, the waste yarn is removed and the resulting live sts are placed onto the needles (you may prefer to place the sts on the needles before removing the waste yarn). The thumb is then worked on these sts. Using MC and smaller needles, CO 44[48, 52] sts. Divide sts between needles and join to begin working in the round, being careful not to twist. Place split ring marker or safety pin in work to indicate beginning of round. Work in 2x2 Rib until work measures 2 inches, or desired cuff length. Next Round: Using larger needles, k2[4, 6], [k4, m1] 10 times, k2[4, 6]. 54[58, 62] sts. Join CC and work first 27[29, 31] sts following Round 1 of Chart A, beginning at 3rd[2nd, 1st] st and ending at 29th[30th, 31st] st of chart as indicated; place marker to indicate beginning of palm sts, work remaining 27[29, 31] sts following Round 1 of Chart B. Work Rounds 2-16 of Chart A, working palm sts following Chart B as set. Next Round [Round 17]: Work first 27[29, 31] sts in patt; k next 8[9, 10] sts using waste yarn, sl these last 8[9, 10] sts back to left needle and work them again in patt as set, using MC and CC; work to end in patt as set. Next Round [Round 17]: Work first 46[49, 52] sts in patt as set; k remaining 8[9, 10] sts using waste yarn, sl these last 8[9, 10] sts back to left needle and work them again in patt as set, using MC and CC. Work rounds 18-41 of Chart A, working palm sts following Chart B as set. Break CC. Using smaller needles, k0[1, 2] rounds. Decrease Round: [Ssk, k to 2 sts before marker, k2tog] twice. Repeat these 2 rounds 7[8, 9] times more, then work Decrease Round once more. 18 sts remain. Place first 9 sts of round on one needle and remaining 9 sts on another needle. Graft together. Remove waste yarn and place resulting live sts on needles; there will be 8[9, 10] sts below waste yarn and 7[8, 9] sts above. Divide sts between needles to begin working in the round. When working first round, pick up and k tbl 1 st in each corner between upper and lower sts. After first round, there will be 17[19, 21] sts. Join MC and k 14[15, 16] rounds, or until thumb measures approx. 0.25 inch less than desired length. Next round: [K2, k2tog] 4[4, 5] times, k1[3, 1]. 13[15, 16] sts. Next round: [K1, k2tog] 4[5, 5] times, k1[0, 1]. 9[10, 11] sts. Next round: K2tog 4[5, 5] times, k1[0,1]. 5[5, 6] sts. With MC and smaller needles, CO 18 sts (9 sts on each needle) using Judy's Magic Cast On. Divide sts evenly between needles, placing a marker to indicate beginning of round, and another marker after the first 9 sts to indicate beginning of palm sts. Increase round: [K1, m1, k to 1 st before marker, m1, k1] twice. Repeat these 2 rounds 8[9, 10] times more. 54[58, 62] sts. Join CC and, using larger needles, work first 27[29, 31] sts following Round 1 of Chart A, beginning at 3rd[2nd, 1st] st and ending at 29th[30th, 31st] st of chart as indicated; work remaining 27[29, 31] sts following Round 1 of Chart B. Work Rounds 2-24 of Chart A, working palm sts following Chart B as set. Next Round [Round 25]: Work first 46[49, 52] sts in patt as set; k remaining 8[9, 10] sts using waste yarn, sl these last 8[9, 10] sts back to left needle and work them again in patt as set, using MC and CC. Next Round [Round 25]: Work first 27[29, 31] sts in patt; k next 8[9, 10] sts using waste yarn, sl these last 8[9, 10] sts back to left needle and work them again in patt as set, using MC and CC; work to end in patt as set. Work rounds 26-41 of Chart A, working palm sts following Chart B as set. Break CC. Next Round: Using smaller needles, k2[4, 6], [k3, k2tog] 10 times, k2[4, 6]. 44[48, 52] sts. Work in 2x2 Rib until cuff measures 2 inches or desired length. Loosely BO all sts using larger needle. Work Thumb and finishing as above. Joeli Caparco has been fooling around with knitting since she was six. They enjoy an amusing relationship so long as seaming stays out of the picture. Joeli recently moved to England and is becoming fond of the hunt for this mysterious thing called "wool".